Sparkling Stampers: It's Good to be Queen! It's Good to be Queen! I found some lovely flocked paper in my stash and used it for the background as well as for her paper-pieced dress. I used a Memory Box die for the fence, cutting it out of shiny gold paper. 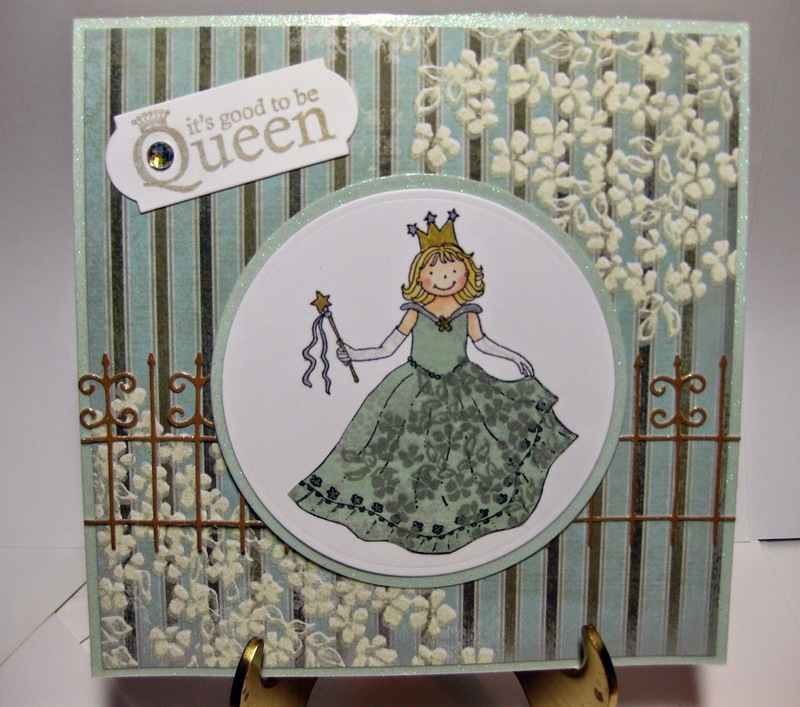 The queen is mounted on a glittery pale green paper, which is also used for the card base. Not sure where I got the die for the sentiment, which is stamped in Encore Gold. I colored her with Copics. Needless to say, she was a big hit at our office birthday celebration! I'll be back with another card in a day or two. This is just so beautiful. Love the fence behind her and the monochromatic colouring. I'm so happy to see you back. Maybe I'll get some oomph to start creating again. God knows I have cards to post too. This card is so inspirational, I think I will use it as my template for Audrey's birthday card.Love the flowers scattered around along with the fence--and the girl brings back very sweet memories. OMG how funny ... 'the queen' is going to love your 'royal' creation! Great paper piecing and that fence is the perfect backdrop! Great job! Thanks so much for playing in our ‘BIRTHDAY’ challenge at Dies R Us! Please come back again soon! Gorgeous card - love your paper piecing. Thanks for joining us at Sweet 7 Digital Designs.